The Lyons Regional Library, like the entire Lyons area, has an fascinating history as well as a bright future! The Library’s temporary home at 405 Main St.
1885 — The Lyons train depot was built using local red sandstone. Lyons became an important railhead for shipping sandstone and gold ore and was also used for tourism. The train depot operated until the 1960s. Late 1970s — The community pooled efforts to transform the abandoned building into the Depot Library. The Town of Lyons Board of Trustees helped resolve the complex ownership dispute while the Lyons Historical Society spearheaded a fundraising drive. Much of the money for the purchase of the building came from bake sales. Residents cleaned up the site, obtained grants, and did restoration work. Graffiti over 100 years old was discovered behind boarded walls. An interior sandstone wall near the checkout desk shows the marks of the masons’ tools. Functioning, historic rolling doors opened the space up and allowed for special indoor-outdoor programs. The Longmont Pioneer Museum returned the original station identification sign, which was placed inside. 1974 — The Depot building was placed on the National Register of Historic Places. Oct. 18, 1977 — The Library opened with a 1,500 book collection and without a heating or cooling system. Red sandstone heats and cools slowly, so the building interior was often either very cold or very hot. Until the Town of Lyons was able to afford heat and air conditioning, staff and patrons had no difficulty imagining what it was like living in the 1880s. 1980s — The original wooden luggage annex was located and reattached to the Depot buliding, doubling the size of the Library. 2005 — An original Lyons railroad depot bench was donated to the Library by the Tisone family. 2006 — The family of F. LaVerne Johnson donated a historic railroad baggage cart located on the west lawn of the Depot building. September 12, 2013 — A devastating flood hit Lyons and the region destroying many homes and severely damaging roads and buildings, including the Depot building. Many Library materials were destroyed, and everything else was placed in a storage pod for safekeeping. 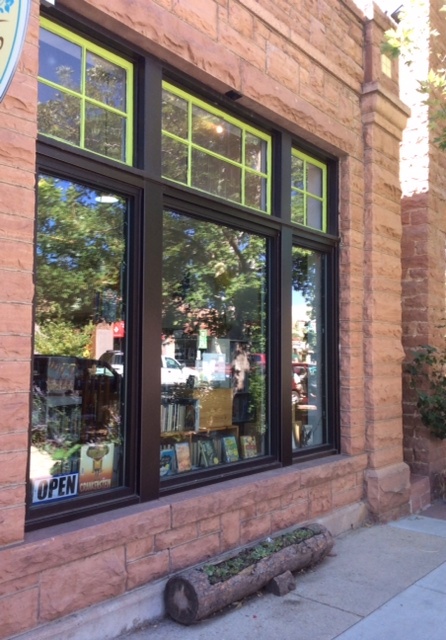 For a few months, the Library was located in the tiny Visitor’s Center building in Sandstone Park. September, 2013 — the Lyons area community renewed its efforts to build and operate a new library following the disastrous flood that destroyed much of the Library and the surrounding areas. April 2014 — The Library moved again to its current (and temporary) location at 405 Main St. This larger space provides more room for materials and programming. April 2016 — The Depot building is completely renovated and is serving as badly needed administration space for the Town of Lyons who owns the building. July 1, 2015 the Lyons Regional Library District began operations to serve its expanded population. The Library District is governed by a separate board of trustees appointed by the Town of Lyons, Boulder County and Larimer County. Now — A new larger Library is being planned and designed to serve the present and future needs of the patrons served by the Lyons Regional Library District! Thank you for all the wonderful support we have received at the Lyons Regional Library!